The 2018 Mascoutah Fall Festival/Chili Cook-Off/Car Show will be held on Saturday, October 20, 2018 in downtown Mascoutah. Each year we have inquiries about this popular event. We hope you will put this on your calendar. Information about entries for the events will be posted later in the year. We look forward to this year’s event being bigger and better than ever. Would You Like To Participate As A Vendor? Read Below. 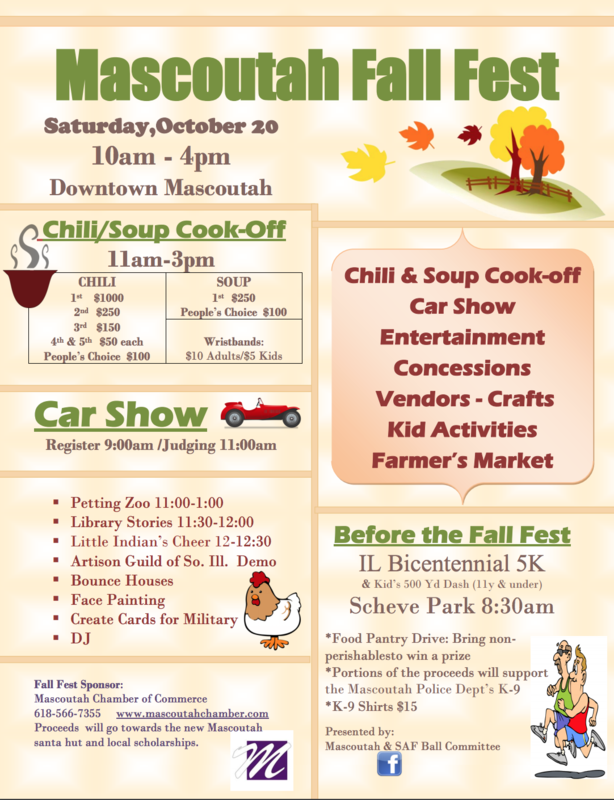 The Mascoutah Chamber of Commerce will host the annual Fall Fest, Chili Cook-off & Car Show on Saturday October 20, 2018 from 10am-4pm on Main Street in downtown Mascoutah. The chili cook-off will be from 11am-3:00pm. This event has steadily increased in participation and popularity. We are currently seeking participants for food/craft booths, art displays, educational booths, entertainment, and chili/soup cook-off participants. This is a fundraising event to support local scholarships as well as a new Mascoutah Santa Hut this year. FOOD, CRAFT, and OTHER VENDORS: The entry form and fees are due by Thursday, September 20, 2018. Vendors will have ~10 feet across in space and the cost is $20. It is configured for tables and small tents, which is NOT supplied. If additional space is needed, it must be noted on the entry form. If you vend from a trailer or truck, please let us know at the time of registration because space is limited. Larger vehicles are subject to additional rental fees. If using a tent, it must be secured well for the safety of the visitors and vendors. Main Street set-up can start after 7:30am when the streets are blocked. Streets are reopened at 5:00pm and your space must be cleaned and vacated by that time. Please stop by the Visitors Center at 200 E Main on the day of the event for directions to your space or visit the chamber website after Thursday October 13, 2018 for a booth number and map to your location. We cannot guarantee you will have the same space as in the past. Space is limited for craft vendors, so reservations are first come first serve basis. Sharing a booth is prohibited. We will only accept a certain number of the same type of vendor. Commercial food booths are $50, have limited availability, and are subject to specific items being sold. It is the vendor’s responsibility to abide by any business laws as well as collect and remit any applicable taxes. The entry form and fees are due by October 7, 2018. Cost is $25.00. Not abiding by the rules is grounds for disqualification. Check in at the Visitors Center after 8am the day of the event for your location and starting supplies. You will receive $25 in Mascoutah Bucks at that time as well. Chili-soup can be prepared on or off site and must be ready to serve at 11:00am. Please make 12+ gallons of Chili-soup per contestant. Chili-soup must be served as prepared. No condiments other than crackers are allowed. You must provide your own tent, table, trash can, trash bags, etc. If you need electric, please make arrangements with a local business and make us aware of your arrangement ahead of time. Cups, spoons, and a ballot box will be provided. NO distribution of beverages is allowed. Only persons who purchase tasting wrist bands are allowed to sample chili-soup and vote for People’s Choice. Around 12pm, a representative will collect a sample for the judges. Identity of the cook will be concealed. Chili and soup will be judged separately. People’s Choice votes will be counted at 3:30. Winners will be announced at 4pm at Railway and Main St.